Summer’s here, so it’s time to kick back and relax, right? Well, kind of. Yes, there needs to be time to have fun and relax; stay up late; play outside; and work on academic skills. This summer my kids are enrolled in our family’s summer school. The focus this summer for all of our kids is Language Arts skills. This is the first lesson in our summer paragraph writing studies – brainstorming. Writing a good paragraph is a necessary skill for future essay writing assignments, creative writing assignments, and papers. It is imperative that students know how to create good transition, topic, supporting, and concluding sentences. This process builds the skills needed to create five paragraph essays, and longer written works, in the future. I am an English/Essay writing tutor, and I work with students at all levels. It never ceases to amaze me how many, otherwise academically advanced, students struggle with putting a solid paragraph together. This lesson is designed for second graders and older. It practices brainstorming, organization, and sentence writing. The second activity works on the editing, revising, and publication steps of the writing process. And, because these are summer school activities, they are only designed to take 15 to 20 minutes. Objective 1: to help students be able to organize their thoughts using a visual organizer. Objective 2: to help students be able to plan their paragraph prior to writing. A copy of the Paragraph Brainstorming Worksheet, available here, for each child. Begin by reminding the children that grammar and spelling aren’t important in this first activity. Help them to focus on idea development and organization. Do not correct spelling or grammar errors. (There is a time for that, but focusing on those details in the prewriting and organizational steps will prevent students from wanting to write.) Writing in the prewriting and organizational phases isn’t about perfection, it is about getting the ideas down on paper. Writing can be scary and overwhelming – so students need to feel safe when they start writing their ideas out. 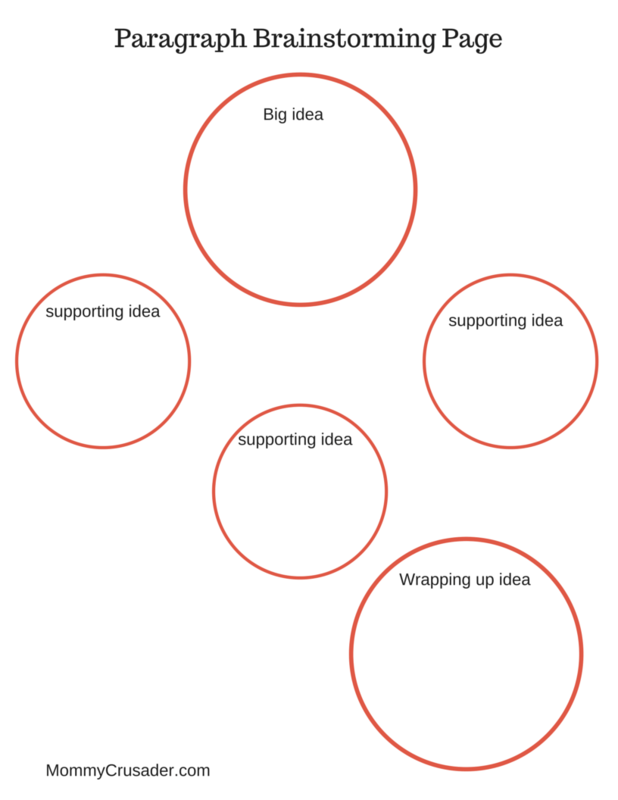 Start by having the children fill in the “Main Idea” circle. Talk with them about the idea they are working on. Do you know enough about this topic to write three more sentences? What do you know about this topic? Is this an interesting topic to you? Next, have the children write down three supporting ideas in the three supporting ideas. Explain that the supporting ideas are ideas that add detail to, or explanation of, the main idea. After the supporting circles are filled, have the children write down an idea that wraps up, or concludes the idea. That’s all for this activity. Breaking the writing into sections helps the children understand the writing process better and not feel so overwhelmed by it. This is important because it reduces any fear or anxiety regarding writing a paragraph. The next activity “Paragraph Sandwiches” will take the ideas on the brainstorming paper and develop them into a complete paragraph.